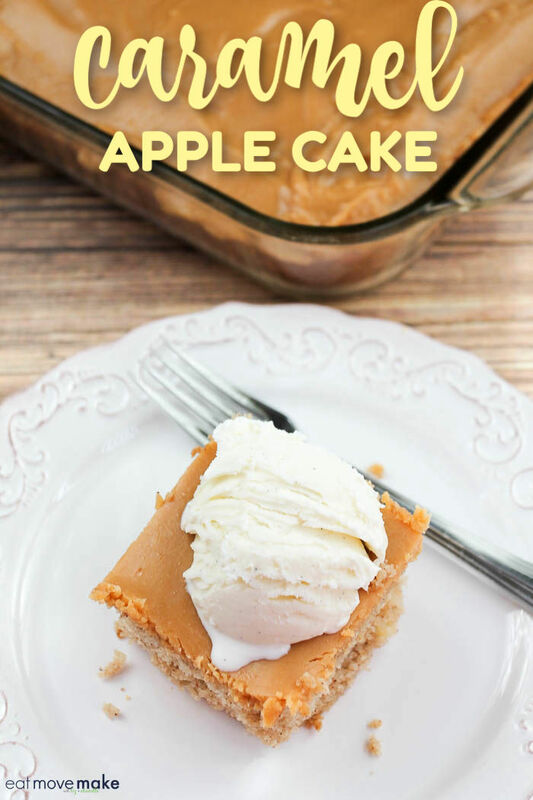 This caramel apple cake recipe post is sponsored in conjunction with #BrunchWeek. I received product samples from sponsor companies to aid in the creation of the #Brunchweek recipes. All opinions are mine alone. Before I got married, the mere mention of caramel cake would set my blood to boiling. My not-yet-my-husband-still-my-boyfriend’s mother used to make it regularly for the girl he used to date and I didn’t want anything to do with anything she liked. Well, except for the guy. I married him. Ha! We divorced a few years ago, and I’m not mad at caramel cake anymore. 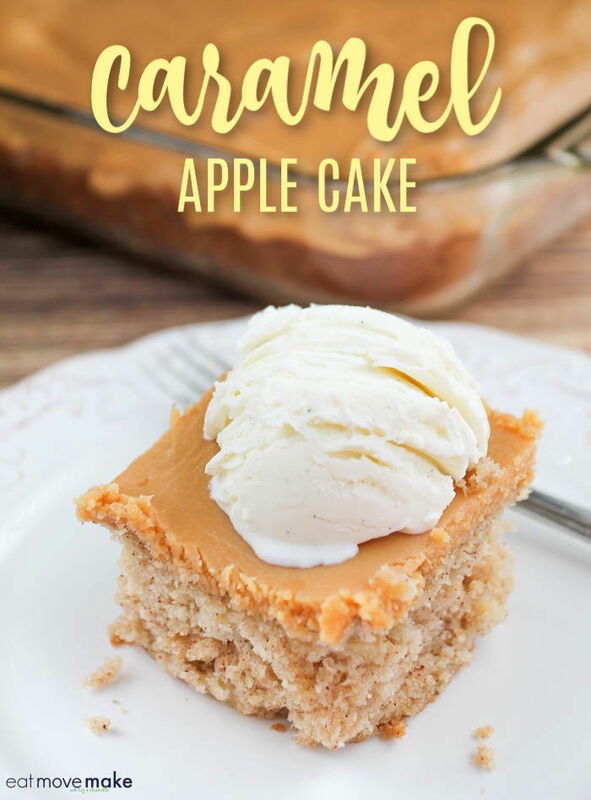 In fact, I love it, but I don’t make my mother-in-law’s recipe; I make mine with apples — so it’s caramel apple cake and it has the most delicious caramel frosting. I make it with whatever kind of apples I have in the house and two medium apples will do the trick just fine. While the cake is baking, start work on the caramel topping. It takes some babysitting, but trust me, it’s worth it! When the cake is still hot, pour that caramel-y goodness over the top, and smooth it as best you can before it starts to harden. 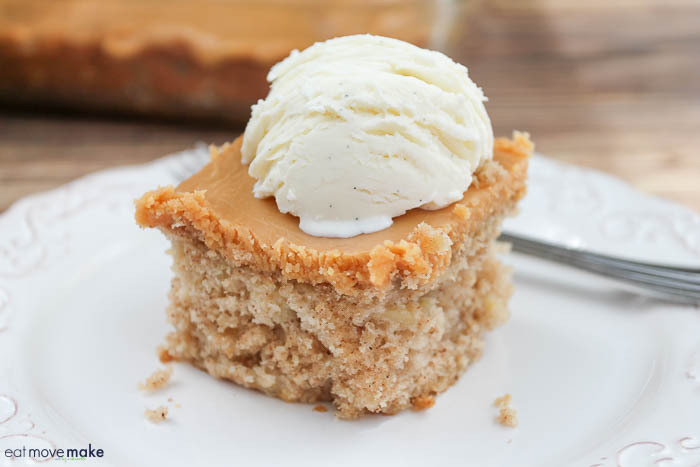 Let the cake and frosting cool completely, then cut into squares and serve with a scoop of vanilla ice cream! Pssst, I used Dixie Crystals sugar in my caramel apple cake! Heat oven to 350 degrees F. Spray 9 x 13 x 2-inch cake pan with baking spray containing flour. In a mixer, beat butter and sugar until well blended, light and fluffy. Beat in eggs one by one. Mix in sour cream and vanilla. In a separate bowl, combine flour, salt, baking powder, baking soda, and cinnamon. Add to wet ingredients in mixer, combining well. Stir in apples. Spoon batter into the prepared baking pan. Bake 40-45 minutes. Let cool on cooling rack for a few minutes, then spread prepared frosting (below) over top. In a large saucepan over medium heat, melt and combine butter, evaporated milk and sugar. 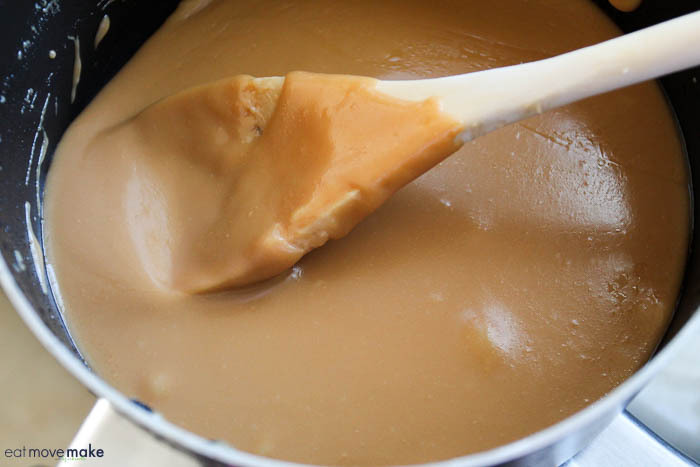 Reduce heat to low and let cook for 1 1/2 - 2 hours until mixture has thickened and turned a golden caramel color. Remove from heat. Stir in vanilla. Spread over warm cake. Let cool completely before serving. Cheesy Artichoke Bruschetta from Daily Dish Recipes. Cheesy Artichoke and Sun-Dried Tomato Bread from Family Around the Table. Greek Asparagus Quiche from The Spiffy Cookie. Ham Egg Cups – 2 Ways from Big Bear’s Wife. Hash Brown Crusted Denver Quiche with Asparagus from A Kitchen Hoor’s Adventures. Roasted Red Pepper Asparagus Egg Tart from Rants From My Crazy Kitchen. Sous Vide Italian Egg Bites from Wholistic Woman. Steak and Egg Mini Quiches from The PinterTest Kitchen. Chocolate Glazed Almond Donuts from The Bitter Side of Sweet. Cinnamon Twist Bread from That Skinny Chick Can Bake. Everything Bagel Crackers from Mildly Meandering. Strawberry Lemonade Donuts from Strawberry Blondie Kitchen. Vanilla Funfetti Donuts from Hezzi-D’s Books and Cooks. Everything Bagel Macaroni and Cheese from Love and Confections. Farmhouse Cheddar ‘N’ Egg Laminated Biscuit Sandwiches from Culinary Adventures with Camilla. Instant Pot Shrimp & Grits from The Crumby Kitchen. Sweet & Savory Monte Cristo Blueberry French Toast from Kudos Kitchen by Renee. Peach and Riesling Glazed Ham from The Redhead Baker. Asparagus with Easy Blender Hollandaise Sauce from Caroline’s Cooking. Grits au Gratin from The Barbee Housewife. Macerated Strawberry Sauce from Amy’s Cooking Adventures. Primavera Pasta Salad from It Bakes Me Happy. Pickled Asparagus from A Day in the Life on the Farm. Caramel Apple Cake from Eat Move Make. Coconut Sour Cream Pound Cake from My Catholic Kitchen. French Coconut Pie with Pine Nuts from Shockingly Delicious. Rustic Raspberry Lemon Cheesecake Tart from Sweet Beginnings. Vintage Gold Cake from Cooking With Carlee. 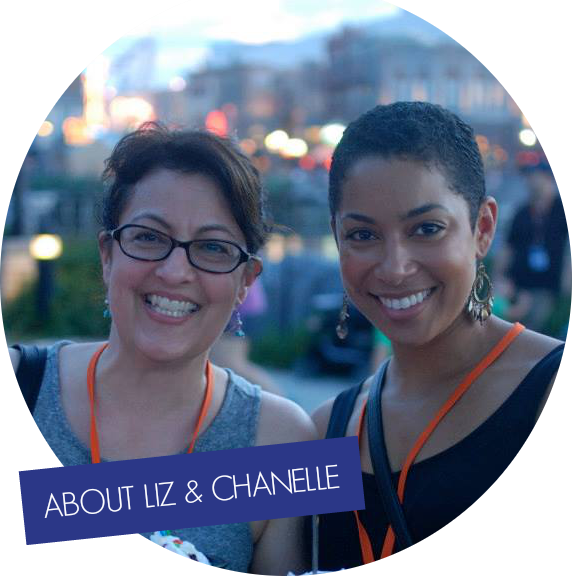 Be sure to enter the #Brunchweek giveaway here for a chance at some amazing prizes! Disclaimer: Thank you to #BrunchWeek Sponsors: Dixie Crystals, Cabot Cheese, LorAnn Oils and Flavors, Cento Fine Foods, Michigan Asparagus, Cal-Organic and Eggland’s Best for providing the prizes free of charge. These companies also provided the bloggers with samples and product to use for #BrunchWeek recipes. All opinions are my own. I love apple cake! I never thought to put a caramel topping on it. Genius! Caramel and apple one of my favorite food combos.With a scoop of ice cream it sounds divine. This looks delicious! I love that the ingredients and simple and straight forward–things that I would easily have on hand! 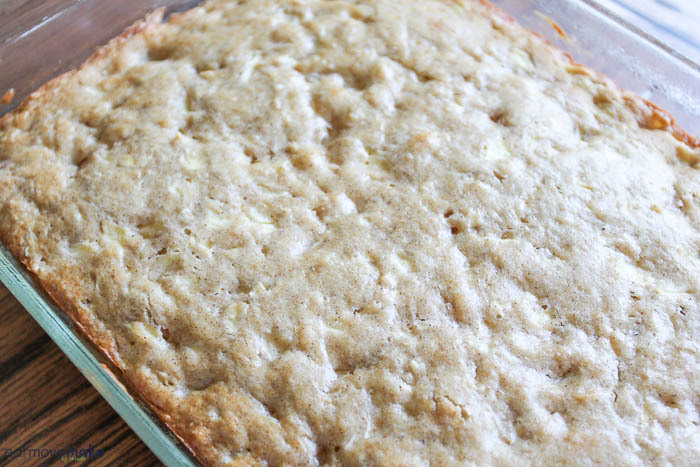 I love apple cake. 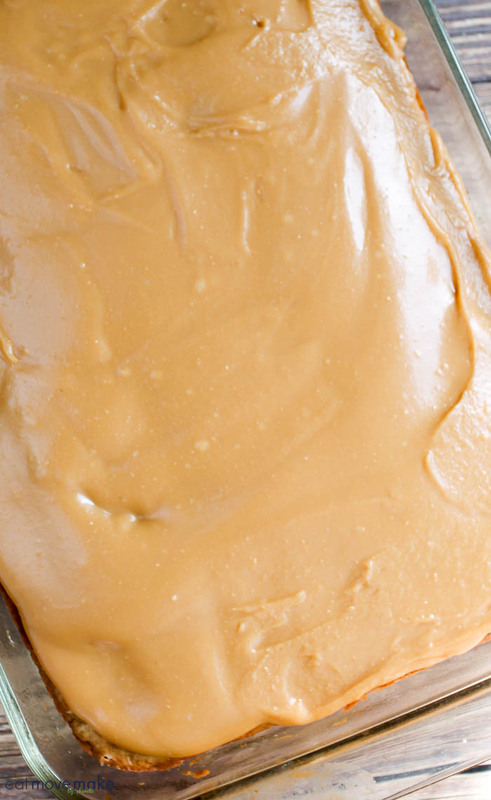 I’m going to have to try it with this caramel frosting. This looks yum! 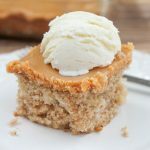 I’ve been really craving a caramel dessert lately, and these look delicious! Yes please! I wonder if Isaak would like this cake for his birthday. I’ll have to ask him. It looks so good!